After the effect of the “Mother Regulation”, which triggered a race for registrations in 2017, pushing the market beyond its actual capacity, tractors sales are back to 2016 levels. Registrations have also declined, as far as other types of machines are concerned, and for the new year, the effects of the general negative economic trend are feared. In order to support the sector, the provision of the EU RDP funds continues, together with the € 35 million re-allocated by INAIL for the purchase of agricultural machinery with high safety standards. After the 2017 surge, due to the forced growth of registrations before the entry into force of the new EU standards for the approval of mechanical vehicles (Mother Regulation), the agricultural machinery market returns to its proper scale. 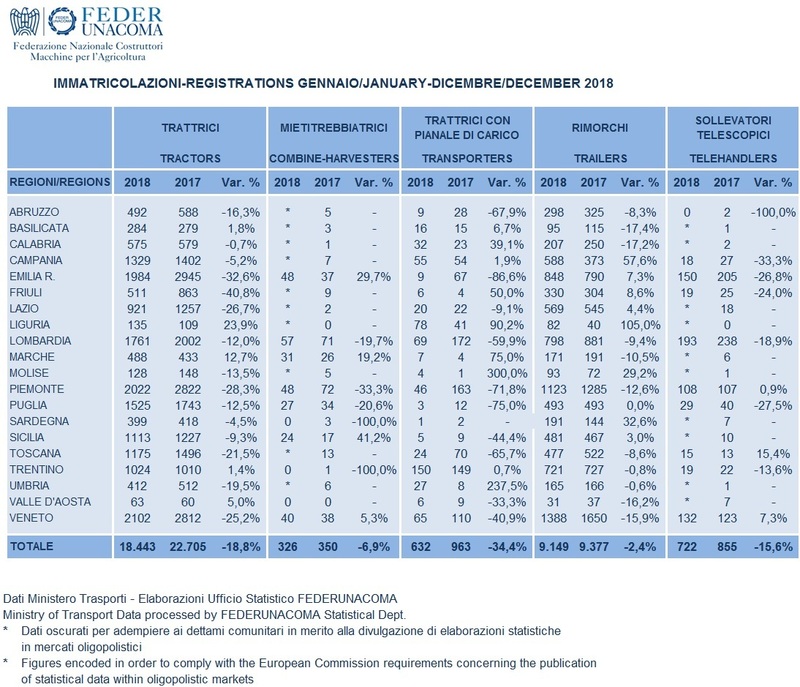 Tractor registrations at the end of 2018 amounted to 18,442, down by 18.8% compared to the previous year (with had recorded an anomalous growth with over 22,700 units and a 23.8% increase) and are in line with the figure for 2016, when the final figure stood at a total of 18,341 units. The decrease in tractors with loading platform (multi-purpose off-road vehicles) is more noticeable, with a drop of 34.6% in 2018, equivalent to 631 units sold, a number far removed from last year’s peak (965 units with an increase of 24.7%). It is also lower than the 2016 figure, when the registrations reached 774. However, the other types of machines, those less affected by the peak of registrations that took place in 2017, recorded a downturn, albeit more modest: combine harvesters fell by 6.9% with 326 units sold, and trailers lost 2.4% with 9.149 units sold. The only type of machines that did not record any increases in 2017, closing with a 4% loss, were telescopic handlers, also confirming its negative trend in 2018 with a decrease of 15.6% with 722 units registered. 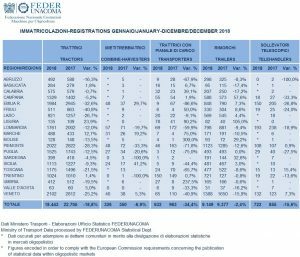 The data, calculated by FederUnacoma on the basis of the registrations provided by the Ministry of Transport, thus reveal a generally weak market, with particularly marked drops, as far as tractors are concerned, in important regions such as Emilia Romagna (-32.6%), Veneto (-25%), Piedmont (-28%) and Lazio (-26.7%). It is premature, according to the association of manufacturers, to make predictions for the new year, which could however be affected by the general trend of the country. Economic indicators show a general decline in production and investments, and the uncertainty in the agricultural sector could further discourage purchases, even if there is not shortage of incentive tools. In addition to the Community funds related to RDP rural development plans, INAIL funds are again available for the purchase of mechanical equipment with high safety requirements. The tender for funding managed by INAIL has been renewed with a financial envelope of 35 million euros, and provides for grants between 40% to 50% of the total expenditure, for the purchase, or even the rental with purchase agreement, of agricultural or forestry tractors and agricultural machinery of various types. Farms can be complete applications online starting from April 11 until May 30. Starting next June 6 it will finally be possible to download the identification code of the applications and know the dates for theit final submission.